Completed in 2014, Rotterdam's Centraal Station is an infrastructure connecting a number of different routes for accessing the city. This significant example of contemporary architecture was designed by the Team CS (Benthem Crouwel Architects, MVSA Meyer en van Schooten Architecten, West 8), winners of the competition held in 2003. The roof is covered with 130,000 solar cells. 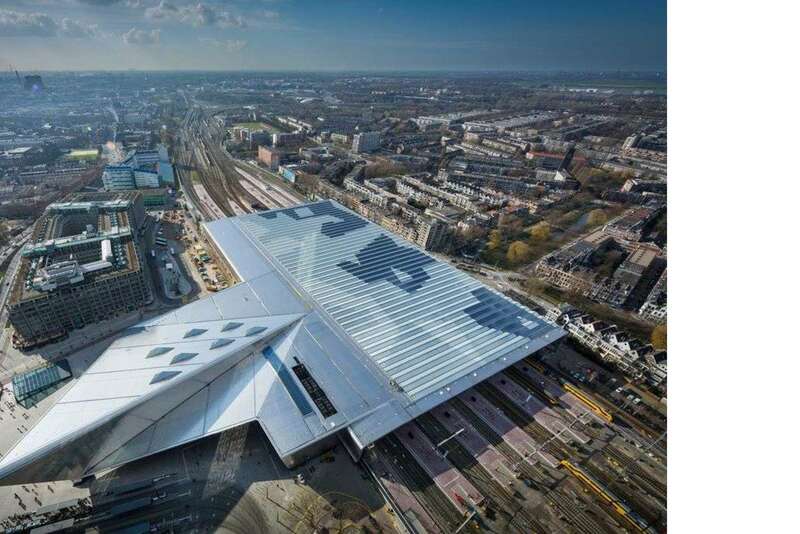 About ten years after the competition for the new central station in Rotterdam, the project by Team CS (Benthem Crouwel Architects, MVSA Meyer en van Sooten Architecten, West 8) was inaugurated by the Dutch king in March. The construction the sovereign presented to the city is one of international scope, featuring contemporary forms sure to be appreciated by the whole population as a new landmark. The materials used in Rotterdam Centraal Station ' the glass in the roof and the northern façade, the wood inside the hall and the steel providing the frame of the whole complex ' identify the building as a symbol of the new Rotterdam. There was a definite need for a new terminal big enough to handle about 110,000 passengers a day, expected to grow to 323,000 in 2025: a number much too high for the old station building. The station is a strategic link between northern and southern Europe, in social and cultural terms too, and the new building aspired to be a new pole of rail, metro, automobile and bicycle transport. The first thing to do was to redevelop and restore to the population the big square in front of the old Rotterdam station built in the '50s by Sybold van Ravesteyn, a Dutch architect known for his infrastructure projects, which has now been demolished. The square that previously contained the bus station has been cleared out and made into a big empty space in the city in preparation for the perspective of the station's new monumental façade. Trams, buses and taxis were moved to the sides of the station, where they have been integrated into the fabric of the city. The station platforms are covered by a clear roof of glass and steel which literally embraces them, giving travellers arriving in the city by train a welcoming sense of shelter. The structure is made light and airy by Y-shaped pillars supporting the roof, a 10,000 square metre surface covered by 130,000 solar cells capable of generating 320 megawatts of power a year. The main entrance to the south and the entrance to the north are very different, the northern one being more rigorous and the southern one more symbolic. Its magic vertical wall of glass makes the northern façade almost invisible, so that the infrastructure fits into the urban fabric of Provenierswijk, a nineteenth-century district from which only a limited number of passengers arrive. The southern side fulfils an iconic function, on the other hand: here the façade is tapered, a big oblique wing extending out into the square, resting on two bases, with an entrance made entirely of glass bearing the historic symbol of Rotterdam Centraal Station and the station clock. The public plaza and the station hall are at the same level and share the same pavement, so that one extends into the other, making the building a monument which fits perfectly into the city. Also at street level, the ticket sales hall extends into a shopping centre with shops, restaurants and offices leading to the northern entrance. The railway tracks are above this level, while the metro station is below.